Restored Agriturismo country estate near to Gubbio in Umbria consisting of main country house of 380 square metres, a barn of 215 square metres, a farmhouse of 330 square metres, a 57-square metre pool house and a headquarters of 400 square metres, for a total surface area of 1382 square metres. 14 hectares land, gardens, swimming pool, olive grove. 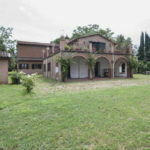 This Umbria country estate is currently utilized as owners accommodation plus agriturismo but would also be suitable for other residential or commercial use, subject to planning permissions. 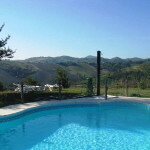 within the municipality of Gubbio, the property lies on a fantastic panoramic position. Accessible through two independent roads, it consists of two separate main bodies: an Agriturismo and a headquarter with owner’s dwelling. 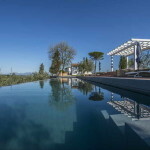 A few kilometres from the E45 highway, that allows to easily reach Perugia and other beautiful towns of the region, it is just 9 kilometres away from the nearest village, Umbertide, where it is possible to find fine restaurants, supermarkets, schools and the train station linking to Sansepolcro and Perugia. The nearest airport it that of Perugia, only half an hour away. 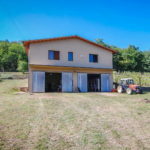 The property is composed of a main country house of 380 square metres, a barn of 215 square metres, a farmhouse of 330 square metres, a 57-square metre pool house and a headquarters of 400 square metres, for a total surface area of 1382 square metres. 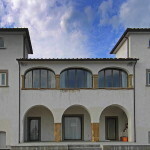 The main country house and the former barn are currently running as Agriturismo and they are composed as follows. On the ground floor there are a restaurant room, a kitchen with pantry, a bathroom and a bedroom with en suite bathroom. The first floor has a spacious bedroom with kitchenette and bathroom, and three apartments, each with kitchenette, bedroom and bathroom. Il has been divided into four independent apartments, composed as follows. They consist of dining with kitchen, bathroom and mezzanine bedroom. It has a kitchenette, a bedroom and a bathroom. It is arranged on two floors, with lounge and kitchen on the ground floor, and two bedrooms and a bathroom on the first floor. Boasting independent access, the 400 square metre headquarter complex includes also the owner’s 330 square metre dwelling and it has a total surface area of approximately 730 square metres, with workshops, storage rooms and technical rooms. The owner’s dwelling houses a dining kitchen, two lounges, a bathroom and three bedrooms. The Agriturismo has been recently restored, maintaining intact the original features of the typical Umbrian farmhouse, terracotta flooring, exposed stone walls and ceilings with wooden beams and terracotta tiles. Surrounded by a lush garden with high trees and flowers, the Agriturismo boasts a horse riding area and an elegant swimming pool overlooking the valley. The Estate is completed by 14 hectares of private land, of which 3,5 of olive grove, 11 of arable land and 0.5 of woodland. FEATURES Terracotta flooring, ceilings with wooden beams and terracotta tiles, exposes stone, fireplaces. Bedrooms: 13 Bathrooms: 12 Plot Size: 140000 m² Living Area: 1382 m² Heating: Radiators Property: Terracotta flooring, ceilings with wooden beams and terracotta tiles, exposes stone, fireplaces.